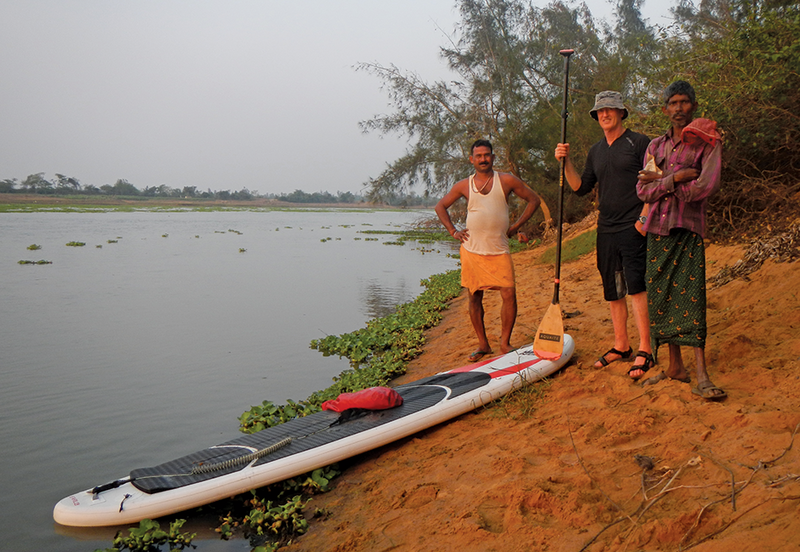 Active 360 recently made the trek to India to see how SUP can be developed and become a sustainable industry. Lake Chilika is a vast expanse of water spread over the Puri, Khurda and Ganjam districts of Odisha state, on the east coast of India, and offers a whole host of SUP opportunities. Paul Hyman talks story about the trip, what he discovered and how he sees stand up progressing in this outstanding area of natural beauty. Chilka is unique in many respects. It provides a similar experience to open ocean paddling but with significantly lower risks – freedom to roam, albeit with shores visible (except in the widest parts), lush landscapes and picturesque vistas. We stopped on an island at the south west end of the lake that was perfect for visitors. Local villagers were welcoming and pleased to provide clean well water and sell us high quality food at low prices. The fish and fresh vegetables we bought from them, and cooked over an open fire, was one of the highlights of the trip. There were grassy areas for camping and sleeping out and temperatures in early March were very comfortable – a tent was only required in the unlikely event of rain. The Eastern Ghats in the western part of the lake provide a dramatic mountainous backdrop for paddling and buildings like the historic (C19th) British Tax Collection point provide a unique and easily recognisable landmark. 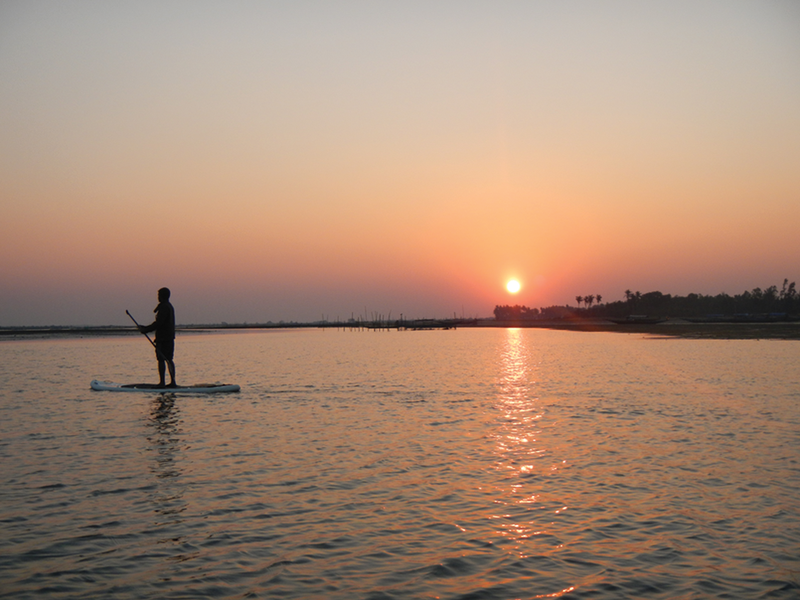 All in all, Chilika is a fabulous destination for stand up paddling. Chilika, for the most part, is a high quality environment and we think SUP could help to protect this by making more people aware of conservation issues and the need to the protect countryside from plastic waste. We found small amounts of debris on our relatively pristine sleeping area – so it would be good to encourage groups of SUP paddlers to clean up an area as part of their trip. In this way they would be contributing to the protection of this unique environment rather than adding to the environmental problem. We saw dolphins several times in different parts of the lake and it’s likely that paddlers would see more of them than visitors on powered craft. The variety of wild birds and fish at Chilika is abundant and apparent at all times. Our journey did not cover the main areas on the lake for this, however we still saw many species. SUP travel to the lake could eventually partially replace more damaging ways of visiting. Viewing dolphins, in particular, by motorized transport could eventually make Chilika an unattractive place if left unchecked. SUP tourism could boost the local economy with well paid and enjoyable work such as guiding and coaching, providing boat transport across the lake and manufacturing SUPs and paddles. Local fishermen and the many skilled boatmen, who work on the lake, would make ideal SUP guides – if they are properly trained. 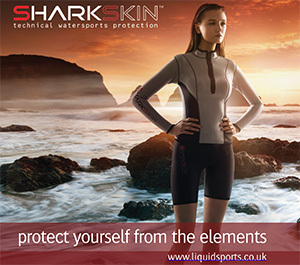 They have a detailed knowledge of the environment and an understanding of risks. The two brothers who guided us were friendly, skilled boat handlers and very good cooks. 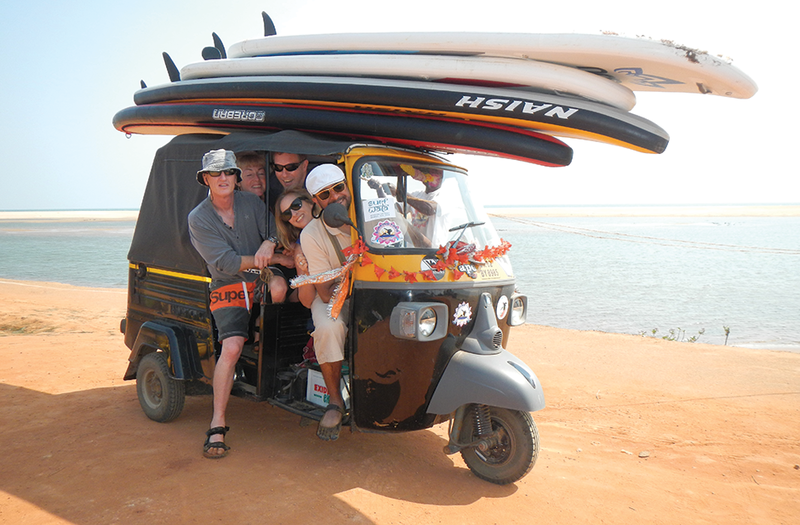 They seemed to enjoy the experience and picked up SUP very quickly. There are some similarities with SUP and poling boats after all. 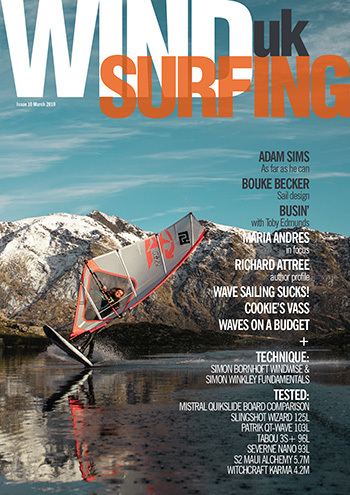 Potential for local boat builders to build SUPs and paddles is obvious. We visited several working on the lake and discussed manufacturing with them. They were very interested and keen to try. Plans and kit exist for SUPs to be built in home workshops from wood and we are confident that production could be set up in Odisha with minimal fuss. It would be ideal if this could happen on the shores of Chilika. Visitors could then paddle on locally produced equipment which would add to the experience. Some help with training and sourcing materials may be required to ensure that equipment is lightweight and high quality, but this is just detail. Participants in watersports often take an interest in protecting marine life. They could be encouraged to take part in short duration clean ups at some of the areas they visit. 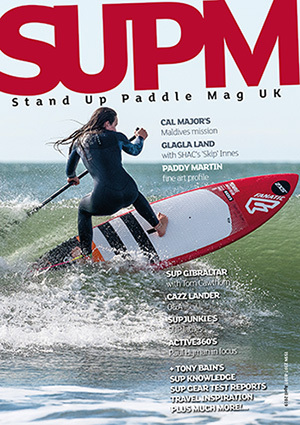 In this way SUP could not only minimise any negative impact, but also help improve the environment. 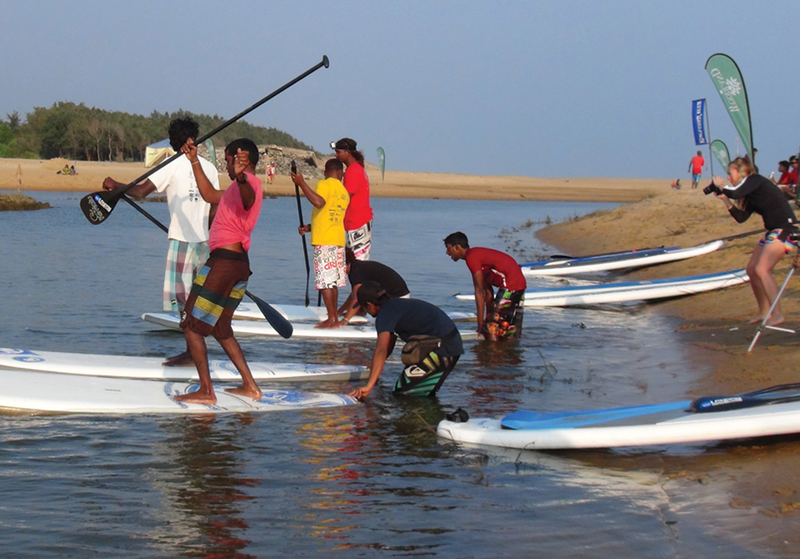 At this stage SUP is a very new sport in India and except for the work of Sanjay Samantaray and the Surfing Yogis there is no SUP happening in Odisha – or in North East part of the country. This could soon change, with some assistance and investment from regional government, and Chilika could annually have thousands of SUP visitors within five or ten years. The lagoon offers outstanding natural beauty and a largely unspoiled environment with a wide diversity of wildlife. Indian food and culture is unique and quirky – cows on roads, vibrant village life, friendly people, simple and fresh produce and unusual cooking methods. Eating out is inexpensive but the quality and range of cuisine is exceptional. 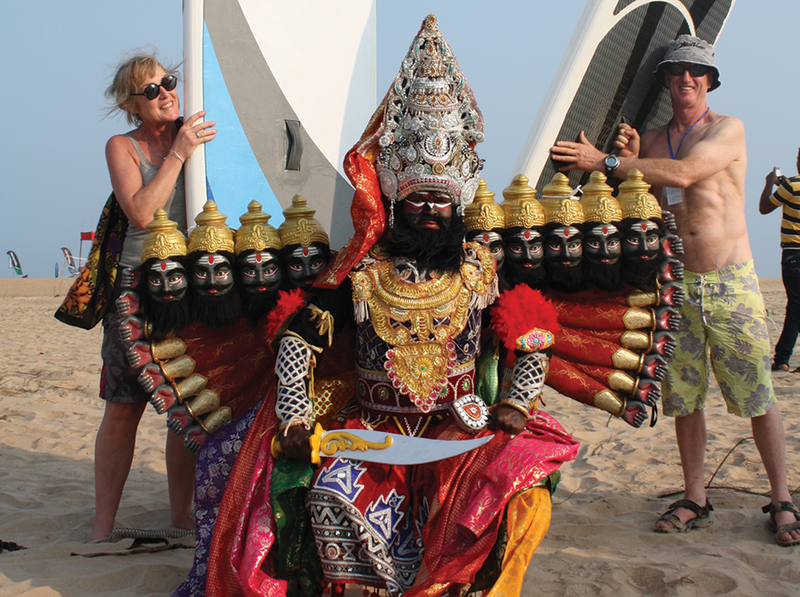 India offers very good value accommodation and internal transport. People in rural parts of Odisha are generally very friendly and welcoming and are keen to converse. Odisha is a relatively undeveloped area but can offer the ‘real India’ – very different from regions extensively visited by tourists. Odisha / Chilika is far superior, right across the board, and for Indian people wanting to try SUP Chilika offers a chance to do so in a perfect and relatively safe setting. Wow, so nice to see this post. Orissa is my hometown and I love Lake Chilika.